The two verse introduction to the gospel text for the Mass of Chrism, an introduction to Jesus’ ministry in Galilee, describes Jesus as returning to Galilee “with the power of the Spirit in him” (Lk 4.14), speaking of God in synagogues and then coming to Nazareth “where he had been brought up” (Lk 4.16). For this Chrism Mass, the explicit linking of the Spirit of God to place and locality, this connection made between the divinity of Jesus and his native heath and soil, this suggested intersection of earth and heaven in the locality and local life of Jesus’ youth, family and community triggered thoughts of the eternal significance of the passing life of our local Church in our diocese and its parishes. What we do, believe, think and say today shapes and makes history, Christian history. As every year in the first days of Holy Week, thoughts roll backwards to the Chrism Mass of last year and to the eight diocesan priests and the many religious, sisters and priests, who have died in the meantime. And then these same thought processes move onwards to the meaning of the annual renewal of our priestly promises as a presbyterium in the presence of parishioners, religious, lay ministers, candidates for the permanent diaconate, members of lay movements, our youth and, pupils and schoolchildren, and all of you, representative of the multi-cellular life of our diocese. That living mosaic of our diocesan life was assembled this past year in the several months work of preparing, drafting and formatting the ad limina Report on the life of the diocese, duly presented to the Holy See for the ad limina Visit in January of this year. Aware of its testimony to the ministries of so many, to the volunteering service of thousands of parishioners in numerous realms of work and care for others, one thought also of all the help called upon from many of you here present in order to prepare that report. And I still stand both humbled and inspired by the energising overview the Report outlined of the pulsating life of this local Church in the parishes and communities of our diocese. The exercise of preparing an ad limina Report with its twenty three chapters, now a centuries old practice, producing a work left to the scrutiny of historians, does run a check-list on the that prophetic mission statement of Isaiah, quoted by Jesus as his own and handed on to us, to each local Church community, as our compass for living out the Word of God in ministry and in daily work and life. Bringing such a report together, ordering its contents, setting out an evaluation and offering orientations for the future on the part of the bishop, entails a certain return to the heart of ministry. You might say it entails a dynamic of conversion, of renewal. Its elaboration focuses on the core and source of priestly service of the gospel, on the living core of the faith community and on the process of evangelisation itself, and therefore on the core significance of the renewal of our priestly promises and vocation at this Chrism Mass. The ebb and flow of life, of ministry itself and of the context for evangelisation seem to have pitched us in recent decades into a never-ending mode of exploration. Indeed in our generation ministry and evangelisation would seem to have come to involve exploration primarily. And that exploration can be disconcerting and discomforting. To respond in the spirit of the gospel and the values of God’s kingdom to our time and culture, marked by uncertainty and by a quest to configure anew authority and the legitimacy of authority, we have to continue to explore, to skill-up and to align our life, ways of thinking and working, our exercise of ministries and our witness with, we trust, “the voice of the hidden waterfall”. But it is also wholesome to know that side by side with the restlessness of our times, this place and this Church of Down and Connor, continues to animate local life, community and the invisible fibres of society. This is the constat, the overall result, what emanated so clearly, so refreshingly, perhaps even surprisingly, from the pages of the ad limina Report 2006-2015. Chapter by chapter – through pages outlining work and ministry in arenas such as, liturgy, worship and prayer ; education ; catechesis and courses in theology in our parishes, and in centres such as, Drumalis and Tobar Mhuire ; co-operation with the missions ; the involvement of laity ; pastoral care of the family ; ecumenism ; prison and hospital chaplaincies ; safeguarding of children and vulnerable adults; outreach to and care of migrants; religious life, institutes of religious life – there emerges an amazing tapestry of prayer and worship, formation in faith for youth and adult, voluntary work and service in charity on the part of thousands in countless arenas of life both here at home and overseas in places of existential need, disaster and crisis. In short, the sometimes tortuous task of drafting that Report uplifted heart and mind : it showed that our parishioners and parishes continue to foster community life, inter-family and inter-generational solidarity, contexts, liturgies, schools and initiatives where the young grow, develop and blossom as individuals. It also indicated that as well as financing the services of our local Church, our parishioners and their numerous organisations generate immense contributions to charity – to mention but a few examples: the Trocaire Lenten Campaign; Pope Francis’ call for aid to the Ukraine ; contributions sent to the Missions by the Down and Connor Apostolic Work; a collection for Syria and further massive aid in materials and financial by the St Vincent de Paul Society, the Knights of St Columbanus and other organisations to refuges and migrants in the Middle East. This is but one measure of the difference that faith and Christian life and solidarity make to eroding the spread of indifference and the globalisation of indifference, that Pope Francis speaks of. The final redaction of the Report brought almost an impulse of delight, not just at a job finished, but rather as the effect of a faith-inspiring wonder at the workings of God’s spirit here in this locality and diocese, here and now. Finishing that Report and looking over its pages, one had a sense of that same Spirit of God which empowered Jesus, alive in us as a people, a local Church, a faith-sharing and faith-formed community. The ministry and work attested to in any such ad limina Report – and each diocese in the world engages in this process – is testimony to Christian worship, prayer, charity and solidarity. Our report presents a snapshot in time of the practical implementation of the mission statement of Jesus in his childhood synagogue. The life it records is the living out of our key elements of the priestly promises. The good news of the ad limina exercise and visit is this : the Church, faith-inspired work and witness, the Christian humus of life and society is far from lifeless, or even from becoming insipid! As ever, the Christian community, like each individual Christian, understands itself to be “semper reformanda”, that it, to be in need of constant renewal and revitalisation in the light of the gospel, to be permanently in need of the renewal of God’s restorative grace and mercy. The continuing work to shape and build the thirteen Pastoral Communities which will serve to facilitate, enrich and support the life of our parishes in the changing societal and ecclesial conditions of the years ahead. In this context we are grateful to the diocesan Living Church Team for imagining, organising and searching graciously granted funding for the outstanding training programme in Facilitative Training in Pastoral Leadership Skills, led in the Drumalis Retreat Centre by the Kinharvie Institute, Glasgow, for both clergy and lay leaders in parishes. This programme was much hailed by participants from various professional backgrounds as well as by participating clergy. Its training is key to pastoring and animating the Christian community today. Its formation in inter-personal and inter-active skills for animating the life of parish and pastoral Community is essential to meet legitimate expectations in our contemporary cultural and societal setting where communication, participation and co-operative and shared responsibility are the pre-conditions of communal vitality, and of the legitimate exercise and reception of leadership and authority in the service of the gospel. In this same regard, I wish to acknowledge the work of our Vicars Forane and the priests on the ground over the past year and a half as we have explored and wrestled with the foundational work and dynamics for the Pastoral Communities. 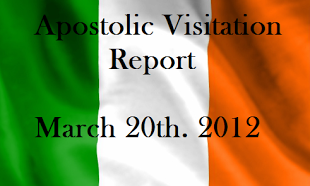 As a diocese we shall continue to explore and shape this mode of pastoral co-operation and sharing of resources and skills, as pioneered particularly by the North Belfast and the North Connor vicariates, and their respective path-finding Pastoral Area Teams and indeed by initiatives in our other vicariates, now known as Pastoral Communities. The training programme for the twelve candidates for the Permanent Diaconate, now in its third year, is a second, innovative and significant vector of future pastoral development in the life of our local Church and diocese. With God’s help, ordinations to the permanent diaconate will take place in autumn 2018. These deacons, to be ordained into major orders, will carry out pastoral ministry in the life of our diocese as it serves people, families and society. They will share in preaching the Word of God. They will minister in various pastoral roles, old and new – in parish, prison, hospital, visiting the house-bound. They will baptise. They will solemnise marriages. They will conduct funerals and bury the deceased. They may work in diocesan services, administration or in shaping a Christian discourse and narrative to assist in giving reasons for the faith that is within us. Supported by their wives and families, if they are married, as most are and will be, on ordination to the permanent diaconate they will form an integral part of the clergy of the diocese. Thus they will be intimate colleagues and co-workers with the priests and bishop of the diocese. As priests and people we are called to prepare for this new moment of grace and enhancement of ecclesial ministry in our diocese. A third and already rising vector, faith-inspired and formative of the inter-personal and communal dimension of faith, is represented by the forthcoming World Meeting of Families (WMoF) in Dublin in August 2018. A team of people with Fr Michael McGinnity, the Family Life and Ministry Team and the Living Church team are already at work. In conjunction with the national team, led by a priest of our diocese, Fr Tim Bartlett, Secretary General of the WMoF, they will roll out a preparatory programme in our parishes as of the autumn. During the ad limina visit in January of this year Pope Francis emphasised that he had chosen Ireland as the venue and expressed his personal hope that this great world gathering will contribute to re-vitalising our appreciation and living of the gift and joy of faith in the person of Jesus Christ. Directly related to the family and family life, yet another vibrant arena of diocesan life is propelled by the multiple engagements with Youth via the Diocesan Youth Commission, the Saint Pope John Paul II Awards supported by the Knights of St Columbanus, Youthlink and its programmes, the Lourdes Youth Team and the innovative GIFT programme (Growing Together in Faith). Together with all present here today I salute the work and dedication of so many in these spheres. I salute in particular the inventive and volunteering spirit of so many of our youth leaders and of our young people, represented by the pupils from various schools present here today. The coming months will also see the roll out of the diocesan consultation of young people, as requested by Pope Francis, by way of preparation for the XV Ordinary Assembly of the Synod of bishops on the subject of, “Young People, the Faith and Vocational Discernment”, to be held in October 2018. Whilst on the subject of youth and care for our youth in the years ahead, as a society we need to initiate a serious public debate on the place of faith-inspired education in state and society. This cannot be left to politicians and public servants alone. A public capacity for such a discussion and an informed and differentiated public opinion on this subject in our local and global context, and in the societal conditions of these times, is a vital necessity for nourishing and shaping cultural identity and for shaping the foundations for responsible citizenship of tomorrow’s ever more complex world. Against a background where all our political parties in Northern Ireland, as instanced by recent election manifestos and party websites, would at least dilute faith-based education, if not abolish its necessary infrastructural underpinnings, there is need on the part of educationalists, parents and citizens to explore, debate and revive the consistency of public appreciation of the irreplaceable contribution of faith-based, and specifically of Catholic education, to the life of both society and the body politic itself. As you listen to these reflections I am sure you could also enumerate other vectors of pastoral development and growth in our diocese. There are indeed many arenas of challenge for us as we try to live and work for the kingdom of God and its values. As pastors we are aware of so many women and men who give voluntarily and unknown and unsung to further the work and mission of the Church. Allow me to mention one final, if newly emergent vector, which we might put under the general heading of an ancient term, peregrinatio pro Christo, and apply it to our contemporary pastoral setting and context. I refer to the willingness to set out in a spirit of spiritual adventure and trust, like the early medieval Irish monks, on a peregrinatio pro Christo (a missionary journey/wandering for Christ) and to navigate unknown, sometimes turbulent and dangerous waters. This readiness to leave the safe harbours of home, comfort zones, fixed ideas and habits for the trial and error of life, for fresh ideas on the life and dynamic of Christian life and faith, is at the heart of the shepherding and leadership, and indeed of the call to discipleship, as re-issued by Pope Francis. Why does his call evoke such remarkable and positive response in the hearts of saint, sinner and seeker, if understandable trepidation for some? Discernment, a key concept he has drawn forth from the Christian heritage, is a subject, a process, a pathway of faith, to be discovered and grown into over a lifetime. It is a key pastoral category for our times and culture. May I suggest that it has something to do with Pope Francis’ absolute respect for mystery of God revealed in the person of Jesus Christ and the same absolute respect for the sacred autonomy of each individual person as made in the image of God, no matter who they are, no matter what has overtaken them in life. A measure of that total respect is reflected in the centrality he gives to “discernment” in his reflections and in his text, Amoris Laetitia, as in the title of the forthcoming Synod of Bishops, mentioned earlier. Discernment is a pathway to adult responsibility, to personal transparency before God and humanity. It is a process which engages both the individual person and community in growth to responsible adulthood in faith and lifestyle. It is like a diamond stone, called forth by Pope Francis from St Ignatius of Loyola and from the Jesuit tradition, and which we need to cut, hew and shape now in our time. Discernment is a challenging process for both the individual and for the community. Its fruit is a more personally grounded faith and a Church, a believing community, that breathes primarily with the liberating values of the kingdom of God. Moving into this key of a discernment-based choice for Christ, for the gospel and for Christian life as an active member of the Church, is a vector for both personal and parish/community/group catechesis and growth in the years ahead. It is the doorway to freedom and maturity in faith and in life. We give thanks for the joy of our priestly vocation and ministry of service, as we now stand and proclaim anew our readiness to serve the gospel and work together in its service with our sisters and brothers in Christ.